Reader James Hawk made an exciting find — he might be related to 17th century English philosopher and physician John Locke. That is Definitely Cool. In capital letters. 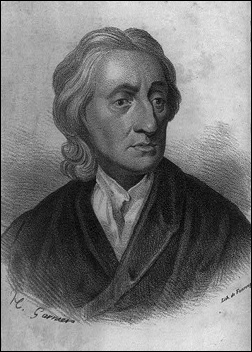 Locke — born in 1632 in Wrighton, Somerset, England — was a political theorist whose early medicine training led him to strongly support the empirical approach in the Scientific Revolution. Let’s start with the fact that Locke himself never married and had no known children.3 So it can’t be direct descent from Locke. And that runs us right into the fact that autosomal DNA is going to eventually punk out on us. So for autosomal DNA in particular, that thing called time to MRCA — the time to the most recent common ancestor — is a critical factor. If it’s just a short time, just a few generations, we’re fine. When it gets back in time, back many generations, our chances of matching someone else who might share that same ancestor get to be … well … remote. How does that play out in this case? Remember that we’re talking about getting back to John Locke’s grandparents — the most recent possible common ancestors here. Each generation can be calculated as roughly 25 years. Some of course will have been longer and some shorter, but that’s a general average often used to calculate the time to MRCA.8 With Locke himself born in 1632, figure his parents would have been born around 1607, and his grandparents around 1582. And let’s figure that we’re likely talking about a genealogist who’s .. um … shall we say … well-seasoned … say, 50 years old. See what I mean? The time to MRCA here is more than 425 years — likely as many as 15 generations. Even if we figured an average generation at 33 years, we’re still talking a dozen or more generations. And here we start getting into the remote or no-realistic-chance-at-all range some 200 years before we’re going to hit that MRCA. I’m not going to go so far as to say it’s absolutely impossible to gather evidence of common descent using autosomal DNA back that many generations. I will say, though, that it’s the longest of long shots, and in this reader’s shoes — even though I am an unabashed fan of DNA testing far and wide — I’d focus my resources on pure paper trail research rather than putting my money on DNA testing here. The time to MRCA just isn’t in our favor in cases like this. In the chart you used, the right hand column is the probability you and a particular person will have a matching segment from a particular ancestor. It is not the probability you will find a match for that ancestor with someone. This is because with each generation, the number of cousins is also increasing. Even at the 8th grandparent range, there is a 50% chance you will have inherited a detectable block of DNA. It is only when you reach about the 10th grandparent, that the chances become truly remote. Obviously this doesn’t effect the analysis of finding a match for a 15th grandparent like Locke, but it definitely effects the chance of finding a match (though not to a particular person) with those sixth to eighth cousins which are the largest part of our match lists. My computer skills don’t allow me to include graphics, but see Table 2 in http://journals.plos.org/plosone/article?id=10.1371/journal.pone.0034267, and http://gcbias.org/2013/11/04/how-much-of-your-genome-do-you-inherit-from-a-particular-ancestor/. Agreed and edited for clarity. I believe that it’s possible Locke had illegitimate children and has living great-grandchildren. There is a musician from the band Spirit who is named John Locke and claims direct but illegitimate descent. If James Hawk and this musician John Locke both did an autosomal DNA test, that putative relationship would be testable. No. Their possible relation to each other could be tested. Their relationship to Locke requires other proof. I would imagine the “I didn’t know it was against The Law defense” would not work very well for you. Totally agree with your conclusion, Judy – chances are it’s not worth chasing by autosomal DNA by any ordinary person. We recently discussed this among a group of DNA family historians and there was a rapid realisation that we all needed to brush up our documentary research skills for the 18th century, but at least DNA has shown us which family tree branches to investigate. Returning to the statistics, there are always the theorists who are more interested in the numerical trade off between the decreasing chances of a provable link, and the increasing number of people potentially available to test. I no longer have the answer at my fingertips, but this sort of problem is dealt with every day of the week by people in Quality Assurance, who have the statistical tools for it. It was just one approach used to bring you safe pharmaceuticals, for example, a few years ago when I worked in that field, and surely it still is. Some usages were controlled by regulatory instruments such as the US Pharmacopeia and the Code of Federal Regulations, as well as some internationally agreed standards. And we’re back to the law! The hitch, of course, with the increasing number of people to test is the equal likelihood of increasing the number of potentially shared lines with those people. When everybody descends from the same group of say 30 pioneer couples, the chances that you can prove descent from couple 1 versus couple 30 are pretty slim. I wonder if the shared DNA percentages are correct in generations 12 and 13 in your table. I would expect the percentages to be 1/2 of the previous generation. The percentages do not change in generation 11, 12, & 13. A small quibble and it doesn’t change your conclusions. Goood catch! Fixed, and thank you! Your cousin may well get hints to the NPE, and if the generations are long enough (enough 60-year-old men fathering children who then wait until age 60 to have their own kids) they could get lucky. Why does James Hawk think he might be related to Locke? He must have some documentary evidence, or family lore that was passed down, or something of the sort. Everything like that is a clue, and whatever he has might suggest the best next step, whether it’s some specific DNA test or something else. There are lots of avenues he might choose to pursue based on the information he has in hand. My only point is that DNA testing isn’t where his money is best spent to begin with. I find it fascinating that the change in probability for the first four generations is pretty incremental, but then suddenly drops significantly for the fifth generation. Judy, as I understand it, when you go back fifteen generations, you run into pedigree collapse. Because of pedigree collapse, we are all related to everyone else. Well, not quite, but almost. So a lot of us are related to John Locke. It’s not that big a deal. You’re likely to hit some pedigree collapse within 15 generations, yes — but not so much as to be able to claim DNA-verifiable kinship to a specific 17th-18th century individual!